The conventional approach to treatment of patients with spondyloarthritis (SpA), particularly ankylosing spondylitis (AS), has serious limitations, adding a sense of urgency to the evaluation of new treatments for these rheumatic disorders. Tumour necrosis factor α (TNFα) is a cytokine that has been shown to mediate inflammatory and regulatory activities in SpA and other immune mediated diseases, including other arthritides and inflammatory bowel disease. Positive results have been reported in several international open label and randomised controlled trials of infliximab and etanercept, the two main biological agents targeting TNFα, which have included approximately 300 patients with SpA. Specifically, TNFα-directed therapy resulted in significant improvements in disease activity, function, and quality of life in these patients, most of whom had AS and received infliximab. 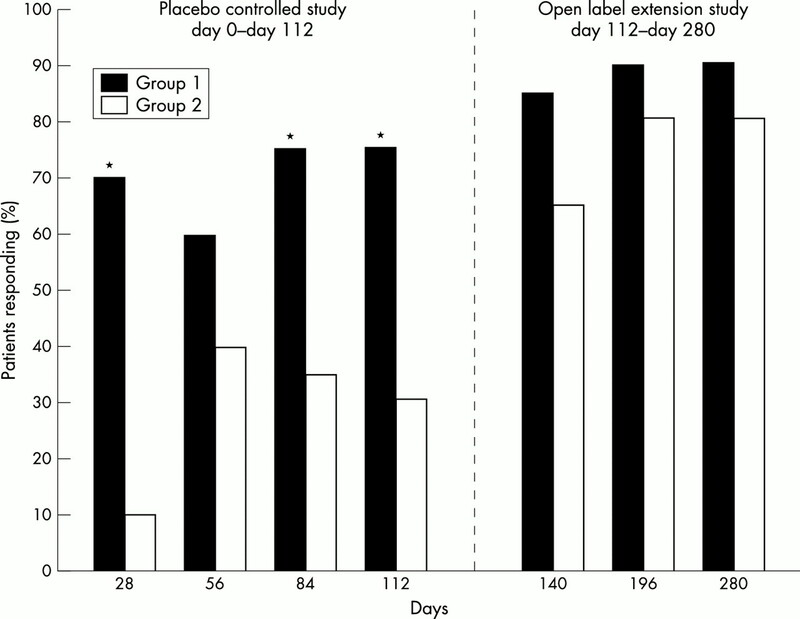 Preliminary evidence from open label, long term extension trials suggests clinical benefit with continued use. Serious side effects were rare and consistent with experience from patient groups receiving infliximab or etanercept treatment for inflammatory bowel disease or rheumatoid arthritis. Together, these findings herald an age of more effective treatment of patients with AS with anti-TNFα and other emerging biological agents. The management of ankylosing spondylitis (AS) with conventional medical treatment has been of limited benefit (see “Conventional treatments for ankylosing spondylitis” within this supplement (p iii40)). Treatments for AS need to address the primary aspects of the disorder—that is, inflammatory back pain and stiffness, peripheral arthritis, and enthesopathy. Slowing or regression of disease progression, visualised by radiograph or magnetic resonance imaging (MRI), and improvement in functional ability and quality of life (QoL), are additional desired outcomes. Non-steroidal anti-inflammatory drugs (NSAIDs) often are effective in reducing pain and stiffness but fail to control disease activity or modify the course of the disease. Second line treatment with sulfasalazine may be most effective in early and active AS with peripheral arthritis1,2 and may prevent anterior uveitis,3 but has only modest effects in more severe disease and disease with substantial spinal involvement. The efficacy of methotrexate and other disease modifying antirheumatic drugs (DMARDs) has not yet been adequately established in controlled trials of AS. As a result, new treatments are needed to help control this chronic, potentially disabling disorder. Biological agents blocking the major effector and regulatory cytokine tumour necrosis factor α (TNFα) are among the new treatments currently being investigated in AS. The two major anti-TNFα therapies that have demonstrated efficacy in the treatment of AS are the chimeric monoclonal IgG1 antibody infliximab (Remicade; Centocor, Inc, Malvern, PA, USA) and the 75 kDa IgG1 receptor fusion protein etanercept (Enbrel; Immunex Corporation, Seattle, WA, USA). In contrast with conventional treatments, these biological compounds target specific inflammatory and immunoregulatory molecules and events affiliated with AS and spondyloarthritis (SpA). Infliximab and etanercept have been used to treat patients with AS in several open pilot and randomised controlled studies conducted in Europe and North America, which have included laboratory, clinical, radiographic, and MRI end points. This review provides the pathogenetic and clinical rationale for the use of these agents in the treatment of AS, evidence of their immunomodulatory effects in patients with the disease, and an overview of findings from the previously mentioned international clinical studies. (A) Computed tomography (CT) guided sacroiliac biopsy specimens from patients with active AS; (B) provided specimens with TNFα mRNA (black spots).5 Adapted and reprinted, with permission from the authors and Wiley-Liss, Inc, a subsidiary of John Wiley and Sons, Inc, from reference 5. Copyright © 1995 Wiley-Liss. The relationship between SpA and inflammatory bowel disease provides further evidence of a role for TNFα in AS. Microscopic and macroscopic bowel inflammation resembling early Crohn’s disease has been found in 20–60% of patients with spinal and peripheral arthritis in AS and other forms of SpA.8,9 Gut lesions in patients with AS can be clinically silent and are more often chronic than acute, particularly in those with peripheral arthritis. The potential for shared pathogenic processes in inflammatory bowel disease and SpA has been suggested by a study conducted by May et al,10 who found identical T cell expansions in the colon mucosa and synovium of a patient with enterogenic SpA. Synovial T cell clones were expanded throughout the colon and peripheral blood and, when stimulated in vitro, produced various cytokines, including TNFα. In vitro studies have shown that production of TNFα is increased in the mucosa of patients with Crohn’s disease,11,12 and controlled clinical studies have documented the efficacy of the anti-TNFα monoclonal antibody infliximab for both acute and maintenance treatment in this inflammatory bowel disorder.13–15 Paradoxically, the anti-TNFα fusion protein etanercept, given at a dose of 25 mg twice weekly, did not effectively induce clinical response in a recently reported placebo controlled trial of patients with active Crohn’s disease.16 Whether this is because of the known pharmacological differences between etanercept and infliximab (for example, recognition of membrane bound TNF by infliximab and lymphotoxin binding by etanercept) is not known. Taken together, these findings provide a strong argument favouring a role for TNFα in AS and suggest that anti-TNFα agents might be effective therapeutic options in this SpA. The latter hypothesis has been further supported by studies of the immunomodulatory effects of these agents in SpA and confirmed by the results of clinical trials in groups with AS. SpA seems to be associated with impairment in the balance of helper T cells subtypes 1 and 2 (Th1 and Th2), demonstrated by reduced T cell production of interleukin 2 (IL2), interferon γ (IFNγ), and TNFα, and increased synthesis of IL10 in the peripheral blood compartment and at the site of the synovial membrane in patients with the disorder.29–34 In a study quantifying T cell cytokine production at the single cell level in patients with AS and healthy controls, Rudwaleit et al noted a significantly lower percentage of TNFα positive T cells in human leucocyte antigen (HLA)-B27 positive patients with AS and HLA-B27 positive healthy controls compared with HLA-B27 negative healthy controls.29,34 HLA-B27 is strongly associated with AS, occurring in approximately 90% of white AS populations.35 Interestingly, low secretion of TNFα, but no difference in the secretion of other Th1 or Th2 cytokines, was detected in patients with early reactive arthritis compared with controls and was significantly correlated with a more chronic course of the disease.36 HLA-B27 positive patients with reactive arthritis had lower TNFα secretion than HLA-B27 negative patients. The lower TNFα expression at the cellular level may be explained by the occurrence of systemic down regulation, while local concentrations may be high. An impaired Th1 profile also has been reported in gut lamina propria lymphocytes from patients with SpA.33 Van Damme et al found lower IFNγ and IL2 production in this lymphocyte compartment and an increased fraction of IL10+CD3+CD8– cells.33 Using the same methodology, these researchers recorded a similar CD3 cytokine profile in patients with Crohn’s disease.37 These findings suggest that impaired Th1 capacity plays a part in the pathogenesis of SpA, possibly through failure of effective bacterial elimination at the initiation of the disease, and that gut mucosal lymphocytes also may actively participate in its development. TNFα appears to be abundantly present at the sites of inflammation, making it a legitimate target of biological treatment. In two open label pilot studies, anti-TNFα therapy has been shown to reverse abnormalities in Th1 cytokine secretion in SpA.6,32 Treatment with three infusions of infliximab in 20 patients with SpA induced a rapid and sustained increase in IFNγ and IL2 levels and a rapid but transient decrease in IL10 levels in patients with high baseline values, resulting in levels similar to those in healthy control patients.32 Similarly, in patients with AS treated with infliximab, investigators observed a significant increase in the percentage of CD3+ TNFα and IFNγ producers after treatment.6 In contrast, in a German placebo controlled study of anti-TNFα therapy, a clear reduction was found in the percentage of CD4− and CD8+ T cells producing TNFα and IFNγ after in vitro stimulation.38 Additional studies are needed to clarify this issue. Further insight into the immunomodulatory mechanisms of anti-TNFα therapy in SpA has been provided by the histological analysis of synovial biopsy tissues from eight patients with treatment resistant SpA, including three patients with AS who were treated with infliximab.39 At week 12, analysis showed reductions in the synovial layer thickness and CD55+ synoviocytes, the vascularity of the synovial sublining layer, and endothelial expression of vascular cell adhesion molecule 1, but not in other adhesion molecules (for example, intercellular adhesion molecule 1, platelet endothelial cell adhesion molecule 1, and E-selectin). The number of neutrophils and CD68+ macrophages in the sublining layer also was decreased at week 12, but no change was seen in the overall degree of inflammatory infiltration because of an increase in CD20+ lymphocytes and plasma cells. Surprisingly, some of these effects, including the adhesion molecule expression, T cell infiltration, and B cell infiltration, may conflict with those reported in RA, suggesting that anti-TNFα therapy may have different immunomodulatory mechanisms in SpA and RA. Several open label and randomised controlled studies have evaluated the efficacy of the anti-TNFα agents infliximab and etanercept on the axial manifestations and peripheral arthritis of AS (table 1). Stone et al recently reported the findings from an open label, single centre Canadian study of infliximab in 21 patients with active AS in whom conventional treatment had failed.45 Patients received the standard induction regimen of infliximab, 5 mg/kg, at weeks 0, 2, and 6. Concomitant drugs, including NSAIDs, methotrexate, sulfasalazine, and corticosteroids, were continued at stable doses throughout the study. Among the 18 patients who were evaluated at week 14, the investigators found a >75% median improvement in functional variables—that is, BASDAI, Bath AS Functional Index (BASFI), Health Assessment Questionnaire, fatigue, and spinal and total body pain. Infliximab was effective in all patients, with the most dramatic response being achieved by patients with shorter disease duration and better baseline clinimetric scores. Two similar but multicentre pilot studies have been conducted assessing infliximab in patients with active refractory AS in Spain and France. In the Spanish study,46 infliximab 5 mg/kg was given to 26 patients with severe SpA at weeks 0, 2, 6, 14, 22, and 30. Eighteen patients with AS were included in this group, all of whom had total ankylosis. Patients were permitted to receive acetaminophen as a rescue analgesic, NSAIDs, and corticosteroids during the study, but not DMARDs. Infliximab treatment resulted in a rapid and significant decrease in clinical disease activity, with clinical response observed after the initial infusion and maintained with subsequent infusions. At weeks 14 and 30, patients demonstrated 57% (p<0.001) and 45% (p<0.001) median improvement in the BASDAI, respectively. Pain, measured using a visual analogue scale (VAS), was reduced by 37% (p<0.001) and 29% (p<0.001) at these times, respectively. Increases were seen in all nine SF-36 measurements, reaching statistical significance in three subconcepts (p<0.05). The investigators noted that the clinical responses in these patients with SpA, although more moderate than those previously reported, were none the less remarkable given the severity of their disease (that is, 69% had complete spinal fusion, or “bamboo spine”). The French experience further supports the dramatic efficacy of this anti-TNFα therapy in axial AS.47 Breban et al evaluated 50 patients with active, refractory, axial AS but no peripheral arthritis or extra-articular manifestations—for example, uveitis or inflammatory bowel disease, at the time of study entry. NSAIDs were continued at stable doses, but DMARDs were discontinued three months before entry. After treatment with infliximab, patients improved significantly in all measures of disease activity and function at week 8 (p<0.0001), with greater than 70% median improvement in global pain and the BASDAI. Maximal improvement was seen as early as two weeks after the first infusion and within 12 weeks in >80% of patients. Response among patients with AS treated with placebo (n=35) or infliximab 5 mg/kg (n=34) at weeks 0, 2, and 6. (A) >50% Improvement in BASDAI; (b) >50% improvement according to the original ASAS Working Group criteria.49 *p<0.0001; p values were calculated by Fisher’s exact test. Adapted and reprinted, with permission from the authors and Elsevier Science, from reference 49. Copyright © 2002 by Elsevier Science. (A) Patient and (B) doctor global assessments of disease activity on a 100 mm VAS among patients with SpA receiving placebo (n=20) or infliximab 5 mg/kg at weeks 0, 2, and 6 (n=20).51 *p=NS; †p≤0.05; ‡p≤0.001; §p≤0.01. Adapted and reprinted, with permission from the authors and Wiley-Liss, Inc, a subsidiary of John Wiley and Sons, Inc, from reference 51. Copyright © 2002 Wiley-Liss. In a single centre study conducted in the United Kingdom, Marzo-Ortega et al treated 10 patients with refractory SpA, including seven patients with AS.52 All patients had active axial disease; the majority had peripheral joint disease (n=7) and enthesitis (n=9). Etanercept 25 mg was given subcutaneously twice weekly for six months. Corticosteroids and sulfasalazine were discontinued before study entry, but methotrexate was continued in six patients throughout the study. At week 24, all patients demonstrated significant improvement in standard clinical, function, and QoL assessments (table 3). Improvements of 79% and 38% in BASDAI and BASFI scores, respectively, were reported from baseline to week 24. Enthesitis also resolved or improved in all patients. In a single centre, randomised, double blind, placebo controlled study conducted in the United States, 40 patients with active AS without complete spinal fusion received either subcutaneous etanercept 25 mg or placebo for four months.53 Patients were permitted to continue receiving stable doses of baseline AS drugs, including NSAIDs, corticosteroids, and DMARDs, during the controlled study period. Response was defined as ≥20% improvement in at least three of five primary outcome measures (that is, duration of morning stiffness, degree of nocturnal spinal pain, BASFI, patient global assessment, and swollen joint count), one of which needed to be duration of morning stiffness or degree of nocturnal spinal pain, without worsening in the other measures. Seventy five per cent of patients in the etanercept group achieved a response at day 112, compared with 30% of those in the placebo group (p=0.01)). Response was observed early (by day 28) and maintained over four months, reaching statistical significance at three of the four month points (fig 4). Analysis of the individual primary outcomes showed significant improvement at four months in the duration of morning stiffness (p<0.001), nocturnal spinal pain (p<0.001), the BASFI (p<0.001), and patient global assessment (p<0.001). Swollen joint counts were lower in etanercept treated patients than in placebo treated patients, but the difference was not statistically significant. Percentage of patients achieving a clinical response. Group 1 received etanercept injections throughout both studies. Group 2 received placebo injections from day 0 to day 112, then etanercept injections from day 112 to day 280. Clinical response defined as at least 20% improvement in three of five outcome measures. *p=0.01. Thirty eight patients from this controlled study were enrolled into a subsequent six month open label extension study of etanercept.53 Preliminary data demonstrate a durable response in >80% of patients who either continued to receive etanercept or switched from placebo to active treatment. Assessments of all disease manifestations, including function, pain, stiffness, global disease activity, peripheral arthritis, entheses, spinal mobility, and QoL, remained significantly better after six months. During the open label study, patients were permitted to decrease or stop AS drugs. Sixty six per cent of all patients stopped or decreased at least one of their AS treatments by the end of the trial. Detection of disease progression in mild to moderate AS may require as long as two years with conventional imaging by radiograph.54–56 However, MRI has been successfully used to visualise acute sacroiliitis, spondylitis, and spondylodiscitis in patients with SpA in recent studies.57,58 In contrast with radiographic imaging, which can show the results of inflammation, bony changes, and ankylosis, MRI can detect acute spinal inflammation. MRI has been used to investigate the impact of anti-TNFα therapy on axial, peripheral, and entheseal disease in patients with AS. 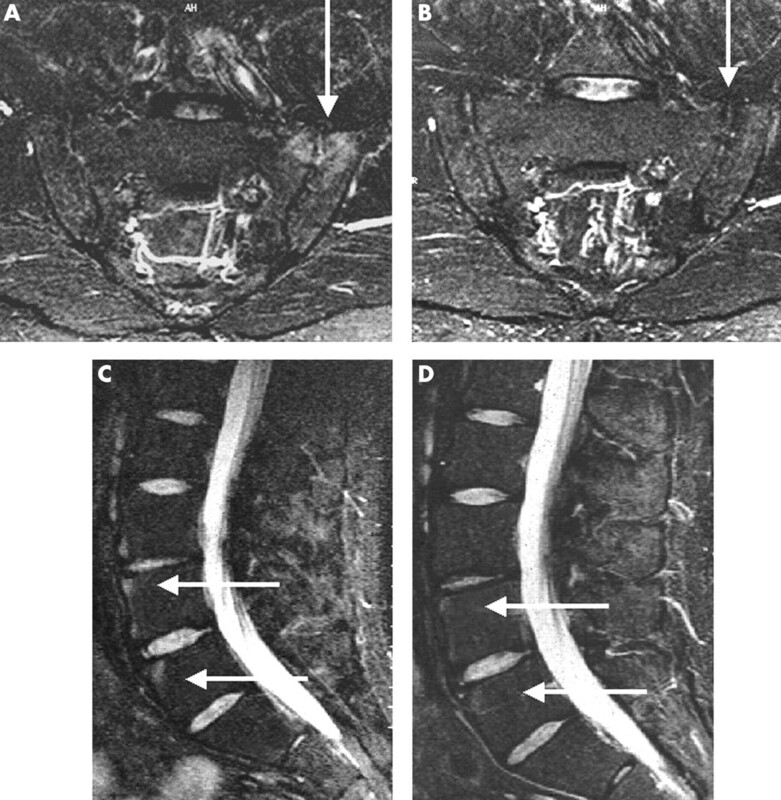 Braun et al recently assessed sacroiliac and spinal MRI changes in 20 patients with AS before and after treatment with infliximab.49 MRI scans after treatment showed resolution of the sacroiliitis and marked improvement in spondylitis, as exemplified by one of the patients (fig 5). A new scoring system was used for spinal MRI (ASspiMRI), which includes an activity score (0–6) that assesses bone marrow oedema by short tau inversion recovery (STIR) and enhancement after gadolinium-diethylenetriamine pentaacetic acid (Gd-DTPA) by scoring 0–3 and, in addition, erosions with signs of active inflammation by scoring 4–6 according to size, while the chronicity score (0–6) assesses sclerosis, erosions (score 1–3), small and big syndesmophytes (score 3–4), partial fusion (score 5), and ankylosis (score 6) by using T1 sequences (minimal score=0, maximal=144 for all three techniques). In correlation with clinical improvement, there was significant regression of spinal inflammation of patients with active AS treated with infliximab 5 mg/kg as assessed by the new MRI scoring system by two independent readers (Braun J, submitted). Sacroiliac joints (SIJ) before (A) and three months after (B) the start of infliximab treatment. Sacoiliitis located in the ventral part of the left SIJ is seen in a T1 sequence after administration of gadolinium-DTPA (A, arrow) but not, using the same technique at the follow up examination (B, arrow). The spinal MRI before treatment shows spondylitis anterior at vertebrae L2-4 at the lumbar spine (C, arrows), which cannot be seen three months later (D, arrows).49 These previously unpublished images are provided courtesy of Dr Matthias Bollow, Augusta Krankenhaus, Bochum and Charité, Humboldt University, Berlin, Germany. In some of the other studies spinal inflammation was also compared before and after treatment with the TNFα blocker. In the study of Stone et al,45 gadolinium-enhanced MRI imaging showed significant changes in both axial and peripheral joints with infliximab treatment. In the open label trial of etanercept in SpA,52 scoring was performed on paired MRI scans of entheseal lesions in the lumbar and cervical spine and peripheral joints at baseline and week 24. Thirty eight of 44 lesions (86%) either resolved completely or improved after treatment, and no new lesions developed. Adverse side effects are the greatest concern with new treatments that are apparently highly effective. There are clearly side effects to be considered in patients treated with anti-TNFα agents. Reports of adverse drug events are reported derived from various sources, including clinical studies, cases reported to regulatory agencies, data reported by drug manufacturers, unpublished cases reported individually or in clusters, and personal experience. Each reporting source has advantages as well as shortcomings. For example, clinical studies are controlled and randomised, but a selected patient group is followed up for a limited period of time. Reports to regulatory agencies are relevant because they reflect how the product is used in practice, but they are uncontrolled and may lead to either underestimation or overestimation of the true risk and reporting bias. Data from manufacturers are often comprehensive but may be influenced by financial interests. Case reports and anecdotal experiences may or may not be relevant but can incite overreaction because personal experience is involved. Thus, the aggregate of these different sources of information should be considered when drawing valid conclusions about adverse side effects. In the case of anti-TNFα agents, such conclusions are still difficult because of limited data and experience. However, the early experience with anti-TNFα therapy has identified seven types of adverse events that seem to be of particular concern: (a) infections, including sepsis and tuberculosis; (b) malignancies such as lymphoma; (c) haematological disorders such as anaemia and pancytopenia; (d) demyelinating disorders and neuropathy; (e) exacerbation of congestive heart failure; (f) production of autoantibodies and autoimmune responses; and (g) infusion or injection and hypersensitivity reactions. Two cases of tuberculosis were reported in randomised placebo controlled investigations of infliximab in SpA.49,51 One case involved a 65 year old man treated with prednisolone (10 mg/day) for PsA. Because he had no history of pulmonary disease, a purified protein derivative test was not performed. He presented with general malaise, high spiking fever, marked increase in ESR and CRP values, but no respiratory symptoms. Mediastinal adenopathy and nodular lesions in the liver and spleen were evident from a computed tomography (CT) scan. Lymph nodule biopsy after mediastinoscopy showed characteristic lesions of tuberculosis. The overall risk of anti-TNFα therapy, however, appears to be small. Immunocompromised and geriatric patients, and those with identifiable comorbidities, are at increased risk of severe side effects. Patients with cardiac insufficiency should not be treated with anti-TNFα agents. Most adverse events seem to be associated with this drug class rather than with individual agents. However, tuberculosis has occurred more frequently among patients treated with infliximab, and there seems to be a higher incidence of demyelinating disease and cytopenia among etanercept treated patients. Both types of sequelae are apparently quite rare. Recent international experience with the anti-TNFα monoclonal antibody infliximab and TNFα soluble receptor compound etanercept clearly suggests that these biological agents are effective in treating patients with AS. Nearly 300 people with SpA, the majority having AS and receiving infliximab treatment, have been evaluated in controlled and open label studies with consistently positive results. Short term benefits have included significant improvements in disease activity, function, and QoL in treatment resistant AS. Long term investigations are continuing, but early reports indicate maintained response for periods of one to two years. Adverse effects data from the SpA studies of infliximab and etanercept seem to be consistent with those reported previously in studies of RA and Crohn’s disease. Serious adverse events, including severe infections (for example, tuberculosis), lupus-like disease, and allergy, were rare, but need to be considered. TNFα is a cytokine that has an essential role in fighting microbes, particularly intracellular bacteria. Although additional information is needed about the possible risk for tuberculosis and other infections with anti-TNFα therapy, recommendations about the performance of tuberculin skin testing before infliximab treatment should be carefully considered. Answers to questions about possible predictors of response to anti-TNFα therapy, optimal dosing, and timing of the start of treatment in the disease course are also required from future studies. Increased attention should be focused also on the ability of anti-TNFα therapy to alter the structural biology of the spine, taking advantage of more sophisticated imaging technology to learn more about the disease’s natural history and its potential modification with pharmacological treatment. The often dramatic efficacy of anti-TNFα therapy in such immune mediated inflammatory disorders as SpA, RA, and inflammatory bowel disease has increased interest in the development of other potentially beneficial biological agents, such as interleukin 1 receptor antagonist. The latter biological treatment has been proved to be effective in RA59 but has yet to be tested in AS. Discovery of the pathogenic relationship between inflammation of the gut and synovium has resulted in the identification of several new therapeutic targets, including specific adhesion molecules, macrophage subsets, and chemokines. Some of the treatments that are clinically effective in Crohn’s disease result in limited mucosal healing,60 whereas others, such as azathioprine61 and infliximab,62 induce both clinical remission and substantial mucosal healing. Because the interaction between gut bacteria and the immune system may play a part in the pathogenesis of AS, treatments that can heal mucosal gut lesions may be of particular interest for the treatment of AS. Although it is too early to speculate about the potential usefulness of other pathogenic targets, it is clear that anti-TNFα therapy represents an essential advance in SpA treatment that has allowed more thorough understanding of disease mechanisms and may lead the way for the introduction of other profoundly effective therapeutic options. Clegg DO, Reda DJ, Weisman MH, Blackburn WD, Cush JJ, Cannon GW, et al. Comparison of sulfasalazine and placebo in the treatment of ankylosing spondylitis. A Department of Veterans Affairs Cooperative Study. Arthritis Rheum1996;39:2004–12. Clegg DO, Reda DJ, Abdellatif M. Comparison of sulfasalazine and placebo for the treatment of axial and peripheral articular manifestations of the seronegative spondylarthropathies: A Department of Veterans Affairs cooperative study. Arthritis Rheum1999;42:2325–9. Benitez Del Castillo JM, Garcia-Sanchez J, Iradier T, Banares A. Sulfasalazine in the prevention of anterior uveitis associated with ankylosing spondylitis. Eye2000;14:340–3. Gratacos J, Collado A, Filella X, Sanmarti R, Canete J, Llena J, et al. Serum cytokines (IL-6, TNF-α, IL-1β and IFNγ) in ankylosing spondylitis: a close correlation between serum IL-6 and disease activity and severity. Br J Rheumatol1994;33:927–31. Braun J, Xiang J, Brandt J, Maetzel H, Haibel H, Wu P, et al. Treatment of spondylarthropathies with antibodies against tumour necrosis factor α: first clinical and laboratory experiences. Ann Rheum Dis2000;59(suppl I):i85–9. Braun J, Sieper J. The sacroiliac joint in the spondyloarthropathies. Curr Opin Rheumatol1998;7:275–83. De Vos M, Cuvelier C, Mielants H, Veys E, Barbier F, Elewaut A. Ileocolonoscopy in seronegative spondylarthropathy. Gastroenterology1989;96:339–44. Mielants H, Veys EM, Cuvelier C, De Vos M. Course of gut inflammation in spondylarthropathies and therapeutic consequences. Ballieres Clin Rheumatol1996;10:147–64. May E, Marker-Hermann E, Wittig BM, Zeitz M, Meyer zum Buschenfelde KH, Duchmann R. Identical T-cell expansions in the colon mucosa and the synovium of a patient with enterogenic spondyloarthropathy. Gastroenterology2000;119:1745–55. MacDonald TT, Hutchings P, Choy M, Murch S, Cooke A. Tumour necrosis factor-alpha and interferon-gamma production measured at the single cell level in normal and inflamed human intestine. Clin Exp Immunol1990;81:301–5. Murch SH, Braegger CP, Walker-Smith JA, MacDonald TT. Location of tumour necrosis factor alpha by immunohistochemistry in chronic inflammatory bowel disease. Gut1993;34:1705–9. Present DH, Rutgeerts P, Targan S, Hanauer SB, Mayer L, van Hogezand RA, et al. Infliximab for the treatment of fistulas in patients with Crohn’s disease. N Engl J Med1999;340:1398–405. Targan SR, Hanauer SB, van Deventer SJ, Mayer L, Present DH, Braakman T, et al. A short-term study of chimeric monoclonal antibody cA2 to tumor necrosis factor alpha for Crohn’s disease. Crohn’s Disease cA2 Study Group. N Engl J Med1997;337:1029–35. Hanauer SB, Lichtenstein GR, Columbel J-F, Mayer L, Schreiber S, Rachmilewicz D. Maintenance infliximab (Remicade) is safe, effective and steroid-sparing in Crohn’s disease: preliminary results from the Accent I trial [abstract]. Gastroenterology2001;120:A-21. Sandborn WJ, Hanauer SB, Katz S, Safdi M, Wolf DG, Baerg RD, et al. Etanercept for active Crohn’s disease: a randomized, double-blind, placebo-controlled trial. Gastroenterology2001;121:1242–6. Ritchlin C, Haas-Smith SA, Hicks D, Cappuccio J, Osterland CK, Looney RJ. Patterns of cytokine production in psoriatic synovium. J Rheumatol1998;25:1544–52. Partsch G, Steiner G, Leeb BF, Dunky A, Broll H, Smolen JS. Highly increased levels of tumor necrosis factor-alpha and other proinflammatory cytokines in psoriatic arthritis synovial fluid. J Rheumatol1997;24:518–23. Ettehadi P, Greaves MW, Wallach D, Aderka D, Camp RD. Elevated tumour necrosis factor-alpha (TNF-alpha) biological activity in psoriatic skin lesions. Clin Exp Immunol1994;96:146–51. Feldmann M, Brennan FM, Maini RN. Role of cytokines in rheumatoid arthritis. Annu Rev Immunol1996;14:397–440. Antoni C, DeChant C, Ogilvie A, Kalden-Nemeth D, Kalden JR, Manger B. Successful treatment of psoriatic arthritis with infliximab in a MRI controlled study [abstract]. J Rheumatol2000;27(suppl 59):24. Ogilvie AL, Antoni C, Dechant C, Manger B, Kalden JR, Schuler G, et al. Treatment of psoriatic arthritis with antitumour necrosis factor-alpha antibody clears skin lesions of psoriasis resistant to treatment with methotrexate. Br J Dermatol2001;144:587–9. Mease PJ, Goffe BS, Metz J, VanderStoep A, Finck B, Burge DJ. Etanercept in the treatment of psoriatic arthritis and psoriasis: a randomized trial. Lancet2000;356:385–90. Yazici Y, Erkan D, Lockshin MD. A preliminary study of etanercept in the treatment of severe, resistant psoriatic arthritis. Clin Exp Rheumatol2000;18:732–4. Maini R, St Clair EW, Breedveld F, Furst D, Kalden J, Weisman M, et al. Infliximab (chimeric anti-tumour necrosis factor alpha monoclonal antibody) versus placebo in rheumatoid arthritis patients receiving concomitant methotrexate: a randomised phase III trial. ATTRACT Study Group. Lancet1999;354:1932–9. Moreland LW, Schiff MH, Baumgartner SW, Tindall EA, Fleischmann RM, Bulpitt KJ, et al. Etanercept therapy in rheumatoid arthritis. A randomized, controlled trial. Ann Intern Med1999;130:478–86. Lipsky P, St Clair W, Furst D, Breedveld F, Smolen J, Kalden JR, et al. 54-Week clinical and radiographic results from the ATTRACT trial: a phase III study of infliximab (Remicade™) in patients with active RA despite methotrexate [abstract]. Arthritis Rheum1999;42:S401. Finck B, Martin R, Fleischmann R, Moreland L, Schiff M, Bathon J. A phase III trial of etanercept vs. methotrexate (MTX) in early rheumatoid arthritis (Enbrel ERA trial) [abstract]. Arthritis Rheum1999;42:S117. Siegert S, Yin Z, Radbruch A, et al. Evidence for a different cytokine secretion pattern of peripheral blood mononuclear cells of HLA B27+ patients with ankylosing spondylitis and HLA B27+ healthy controls compared to HLA B27-negative controls [abstract]. Arthritis Rheum1998;41:S287. Canete JD, Martinez SE, Farres J, Sanmarti R, Blay M, Gomez A, et al. Differential Th1/Th2 cytokine patterns in chronic arthritis: interferon gamma is highly expressed in synovium of rheumatoid arthritis compared with seronegative spondyloarthropathies. Ann Rheum Dis2000;59:263–8. Yin Z, Siegert S, Neure L, Grolms M, Liu L, Eggens U, et al. The elevated ratio of interferon gamma-/interleukin-4-positive T cells found in synovial fluid and synovial membrane of rheumatoid arthritis patients can be changed by interleukin-4 but not by interleukin-10 or transforming growth factor beta. Rheumatology (Oxford) 1999;38:1058–67. Baeten D, Van Damme N, Van den Bosch F, Kruithof E, De Vos M, Mielants H, et al. Impaired Th1 cytokine production in spondyloarthropathy is restored by anti-TNFalpha. Ann Rheum Dis2001;60:750–5. Van Damme N, De Vos M, Baeten D, Demetter P, Mielants H, Verbruggen G, et al. Flow cytometric analysis of gut mucosal lymphocytes supports an impaired Th1 cytokine profile in spondyloarthropathy. Ann Rheum Dis2001;60:495–9. Rudwaleit M, Siegert S, Yin Z, Eick J, Thiel A, Radbruch A, et al. Low T cell production of TNFalpha and IFNgamma in ankylosing spondylitis: its relation to HLA-B27 and influence of the TNF-308 gene polymorphism. Ann Rheum Dis2001;60:36–42. van der Linden S, van der Heidje D. Ankylosing spondylitis. Clinical features. Rheum Dis Clin North Am1998;24:663–76. Braun J, Yin Z, Spiller I, Siegert S, Rudwaleit M, Liu L, et al. Low secretion of tumor necrosis factor alpha, but no other Th1 or Th2 cytokines, by peripheral blood mononuclear cells correlates with chronicity in reactive arthritis. Arthritis Rheum1999;42:2039–44. Van Damme N, De Keyser F, Demetter P, Baeten D, Mielants H, Verbruggen G, et al. The proportion of Th1 cells, which prevail in gut mucosa, is decreased in inflammatory bowel syndrome. Clin Exp Immunol2001;125:383–90. Zou J, Rudwaleit M, Thiel A, Braun J, Sieper J. Downregulation of the non-specific and antigen-specific T cell cytokine response in ankylosing spondylitis after treatment with infliximab [abstract]. Arthritis Rheum2001;44:S236. Baeten D, Kruithof E, Van den Bosch F, Demetter P, Van Damme N, Cuvelier C, et al. Immunomodulatory effects of anti–tumor necrosis factor α therapy on synovium in spondylarthropathy. Histologic findings in eight patients from an open-label pilot study. Arthritis Rheum2001;44:186–95. Brandt J, Haibel H, Cornely D, Golder W, Gonzalez J, Reddig J, et al. Successful treatment of active ankylosing spondylitis with the anti-tumor necrosis factor alpha monoclonal antibody infliximab. Arthritis Rheum2000;43:1346–2. Brandt J, Haibel, H, Sieper J, Reddig J, Braun J. Infliximab treatment of severe ankylosing spondylitis: one-year followup [letter]. Arthritis Rheum2001;44:2937. Van den Bosch F, Kruithof E, Baeten D, DeKeyser F, Mielants H, Veys EM. Effects of a loading dose regimen of three infusions of chimeric monoclonal antibody to tumour necrosis factor α (infliximab) in spondyloarthropathy: an open pilot study. Ann Rheum Dis2000;59:428–33. Mielants H. Treatment of refractory SpA/AS with TNFα-blockers: the Belgian experience. Lecture presented at: International Workshop on New Treatment Strategies in Ankylosing Spondylitis; 18–19 January 2002; Berlin, Germany. Stone M, Salonen D, Lax M, Payne U, Lapp V, Inman R. Clinical and imaging correlates of response to treatment with infliximab in patients with ankylosing spondylitis. J Rheumatol2001;28:1605–14. Collantes Estévez E. Treatment of refractory SpA/AS with TNFα-blockers: the Spanish experience. Lecture presented at: International Workshop on New Treatment Strategies in Ankylosing Spondylitis; 18–19 January 2002; Berlin, Germany. Breban M, Vignon E, Claudepierre P, Devauchelle V, Wendling D, Lespessailles E, et al. Efficacy of infliximab in refractory ankylosing spondylitis: results of a six-month open-labeled study. Rheumatology (Oxford) (in press). Maksymowych WP, Jhangri GS, Lambert RG, Mallon C, Buenviaje H, Pedrycz E, et al. Infliximab in ankylosing spondylitis: a prospective observational inception cohort analysis of efficacy and safety. J Rheumatol2002;29:959–65. Braun J, Brandt J, Listing J, Zink A, Alten R, Krause A, et al. Treatment of active ankylosing spondylitis with infliximab—a double-blind, placebo-controlled multicenter trial. Lancet2002;359:1187–93. Braun J. Treatment of refractory SpA/AS with TNFα-blockers: the German experience. Lecture presented at: International Workshop on New Treatment Strategies in Ankylosing Spondylitis;18–19 January 2002; Berlin, Germany. Van den Bosch F, Kruithof E, Baeten D, Herssens A, de Keyser F, Mielants H, et al. Randomized double-blind comparison of chimeric monoclonal antibody to tumor necrosis factor α (infliximab) versus placebo in active spondylarthropathy. Arthritis Rheum2002;46:755–6. Marzo-Ortega H, McGonagle D, O’Connor P, Emery P. Efficacy of etanercept in the treatment of entheseal pathology in resistant spondylarthropathy. Arthritis Rheum2001;44:2112–17. Gorman JD, Sack KE, Davis JC Jr. Treatment of ankylosing spondylitis by inhibition of tumor necrosis factor α. N Engl J Med2002;346:1349–56. Spoorenberg A, de Vlam K, van der Heijde D, de Klerk E, Dougados M, Mielants H, et al. Radiologic scoring methods in ankylosing spondylitis: reliability and sensitivity to change over one year. J Rheumatol1999;26:997–1002. MacKay K, Mack C, Brophy S, Calin A. The Bath Ankylosing Spondylitis Radiology Index (BASRI): a new, validated approach to disease assessment. Arthritis Rheum1998;41:2263–70. Averns HL, Oxtoby J, Taylor HG, Jones PW, Dziedzic K, Dawes PT. Radiological outcome in ankylosing spondylitis: use of the Stoke Ankylosing Spondylitis Spine Score (SASSS). Br J Rheumatol1996;35:373–6. Braun J, Bollow M, Eggens U, Konig H, Distler A, Sieper J. Use of dynamic magnetic resonance imaging with fast imaging in the detection of early and advanced sacroiliitis in spondyloarthropathy patients. Arthritis Rheum1994;37:1039–45. Braun J, Bollow M, Sieper J. Radiology and pathology of the spondyloarthropathies. Rheum Dis Clin North Am1998;24:697–735. Bresnihan B, Alvaro-Gracia JM, Cobby M, Doherty M, Domljan Z, Emery P, et al. Treatment of rheumatoid arthritis with recombinant human interleukin-1 receptor antagonist. Arthritis Rheum1998;41:2196–204. Modigliani R, Mary J-Y, Simon J-F, Cortot A, Soule J-C, Gendre J-P, et al. Groupe D’Etude Thérapeutique Des Affections Inflammatoires Digestives. Clinical, biological, and endoscopic picture of attacks of Crohn’s disease. Evolution on prednisolone. Gastroenterology1990;98:811–18. D’Haens G, Geboes K, Rutgeerts P. Endoscopic and histologic healing of Crohn’s (ileo-) colitis with azathioprine. Gastrointest Endosc1999;50:667–71.